You are here: Home / Coca-Cola Campaign / WANTED AidPod makers . . .
2 Print them out. NOTE: Make sure you have ‘Page scaling’ turned off in the print dialogue box. 9 Start again at step one! www.flickr.com/photos/tags/myaidpod. We will pull these into the blog once we’ve got one or two in place. 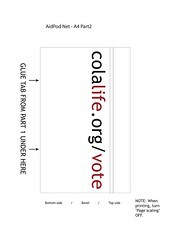 If you live in London or Rugby and were willing to dedicate your creations to the cause (we are going to need lots when our voting campaign starts) leave a comment or contact me (simon[at]colalife[dot]org) and I’ll let you know where to bring them. 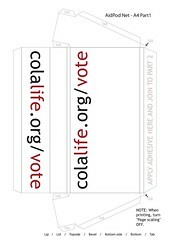 Thank you ColaLife.I am an African in Tanzania.I heard about your plans of development starting in Dar es salaam.You are really helping us.Thank you so much.May God bless you. Are you still collecting Aidpods?